This exciting ride will take you from the heart of London through beautiful English villages and into the stunning countryside of rural France before you reach Paris and end your challenge under the Eiffel Tower! Whether you are an experienced rider looking to put in some mileage or a complete beginner on your first ever multi-day ride, you will find other cyclists at your level, make friends for life and go on an incredible adventure which will stay with you forever. 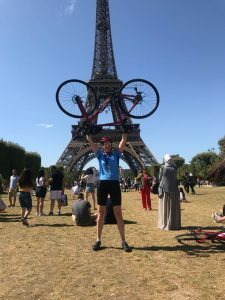 Please do take a peek through the London to Paris brochure where you will find everything you’ll need to know about the ride, including a full itinerary, what to pack, trip tips and how to get started on your fundraising! You’ll also find a reservation form so you can book your place today. People of all ages and from all walks of life take part in this fantastic cycle and what you all have in common is the desire to do something amazing for charity. You will make friends for life and experience a once in a lifetime trip together – so what are you waiting for? Sign up now and join us for the challenge that will stay with you forever! 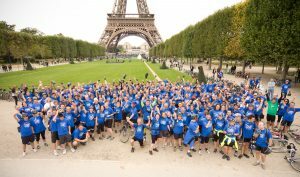 Click here to register your place on the London to Paris Bike Ride!